Like careers in medicine or law, a career in coding was often a long road. Much has changed in the industry, and today it’s possible to get started without being accepted at a prestigious university or working for years on an advanced degree. In fact, you can probably go to work right away after learning the skills that employers require. Don’t sell yourself short with these common misbeliefs. Elite technology companies: Google, Apple, Facebook, Microsoft, Twitter, and Yahoo! are some of the world’s most elite technology companies. Because of their sheer size and name recognition, they employ recruiters who screen for certain attributes, such as college affiliation. College graduates from top schools apply to these companies in overwhelming numbers. Although it is not impossible to be hired at one of these companies without a college degree, it is very difficult. To find out which colleges serve as feeder schools for the top technology companies, read this Wired article. Fortune 1000 companies: Large companies such as Verizon and AT&T hire thousands of engineers a year, making their initial requirements for hiring slightly more flexible. These companies typically look for a college degree or two to three years of relevant experience with a specific programming language. Startups and small companies: Startups are sympathetic to nondegree holders, and many startup employees are currently in college or are college dropouts. Although startups don’t require a college degree, a great deal of emphasis is put on what you’ve built previously and your ability to code under tight deadlines. Well-funded startups are often a good place to gain experience because they need talent to keep growing and often compensate employees as well as the more mature companies do. Freelancing and contracting: When working for contracting websites such as Upwork or for yourself, the main consideration is whether you can complete the job. Few employers check whether you have a college degree; a portfolio of past work, even if it was unpaid, is much more important to securing the job and conveying the confidence that you’ll be able to deliver the project on time and within budget. Interest in nontraditional candidates is growing. Companies such as Entelo specialize in sourcing and scoring candidates with nontraditional markers of success, such as blog posts, Stack Exchange answers, Twitter comments, and code posted to GitHub. Studies have shown that there is no correlation between experience and performance in software development. For the new programmer, after you master some basic skills, your performance is affected by much more than the amount of time you’ve spent on a job. Despite the research, however, some companies still screen for years of experience when filling open positions. Much of the same logic that applies to getting a coding job without a college degree applies here as well. Elite technology companies receive so many resumes and are in such high demand that they can be more selective and look first at experienced candidates. Fortune 1000 companies usually take one of two approaches: They look for a minimum one to two years of experience, or they understand that as a new hire, you’ll need training and use existing staff to help support you. Startups and small companies typically pay the least attention to the number of years of experience and more attention to your previous projects. Your contributions to an open-source project or a weekend project that attracted real users will generate plenty of interest and enthusiasm for you as a candidate. Although it can be easier to get your foot in the door at a startup, remember that the company’s small size likely means there are fewer people and less money to devote to your training and support, so much of your learning will be self-supported. Companies of any size willing to invest in developing your programming abilities will typically look for a positive attitude, a willingness to learn, and the persistence to keep trying to solve problems and overcome obstacles. Whether in the Law and Order: SVU portrayal of women in technology or the national media reports of the high-powered lawsuit filed by Ellen Pao about her treatment in the technology industry, the tech industry has not had the best year for welcoming women and minorities. Admittedly, the numbers show a story that has improved but still has plenty of room to grow, with the tech industry workforce made up of 25 percent women and 5 percent minority workers, which is below the national averages for both groups. The Wall Street Journal has compiled publicly released diversity data from top tech companies broken down by leadership and technology positions. 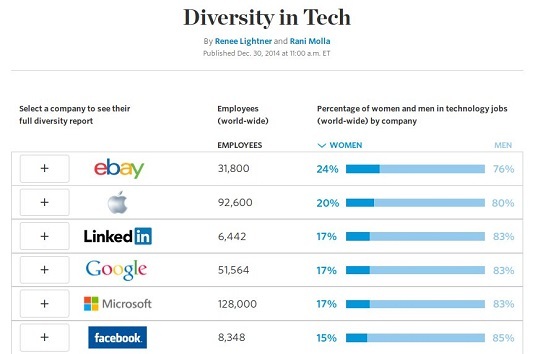 WSJ compilation of diversity in tech companies based on public filings. Although many contributing causes have been identified, including the lack of a pipeline of candidates studying computer science or applying to tech firms, many leading companies and nonprofits are actively trying to increase the recruitment and support of women and minorities in the workplace. On the corporate side, larger companies are creating programs that train and increase the number of pathways to join the workforce. For example, Google recently launched a $50 million campaign called Made with Code to highlight women in tech and provide opportunities for girls to learn to code. Similarly, nonprofit organizations such as Code 2040 connect Black and Latino talent to companies. On the training side, nonprofits such as Yes We Code, Girls Who Code, Black Girls Who Code, and Women Who Code teach technical skills to increase the number of women and minorities entering the jobs pipeline. Many of the most famous tech companies, including Apple, Facebook, Google, Twitter, and Yahoo!, are located in Silicon Valley. While these and other companies in the San Francisco and Silicon Valley area hire a large number of tech workers each year, that paints only part of the picture. Cities across the United States pay tech salaries comparable to San Francisco but have a much lower cost of living. Two numbers to keep in mind when evaluating a city are the average salaries paid to tech workers and the average cost of living. Salary minus rent provides a simple and rough estimate of take-home pay, though it doesn’t take into account taxes, transportation, and cost of goods and services. Although San Francisco does pay the most of any city in the country, it looks less attractive after subtracting the cost of rent from annual pay. By contrast, cities such as St. Louis and Seattle offer strong salaries with a much lower cost of living. A cost of living calculator will help you compare salaries in different cities. See, for example, the PayScale cost of living calculator. Coding skill is one important factor that tech companies evaluate when hiring coders. But just as important is your domain knowledge and ability to work and lead a team. For example, perhaps you’re a lawyer looking to switch careers and become a coder. Your legal knowledge will far exceed that of the average programmer, and if you target companies making software for lawyers, your perspective will be valuable. Similarly, whether you previously were in finance or marketing, the issues around managing and leading teams are similar. It is natural for a team of people to disagree, have trouble communicating, and end up short of the intended goal. Your previous experiences handling this type of situation and turning it into a positive outcome will be valued in a tech company, where much of the coding is performed in teams. Finally, your current or previous job might not seem technical, but others like you have made the transition into a coding job. People from a variety of professions — such as lawyers, teachers, and financial analysts — have learned how to code, and found ways to incorporate their past work experiences into their current coding careers.